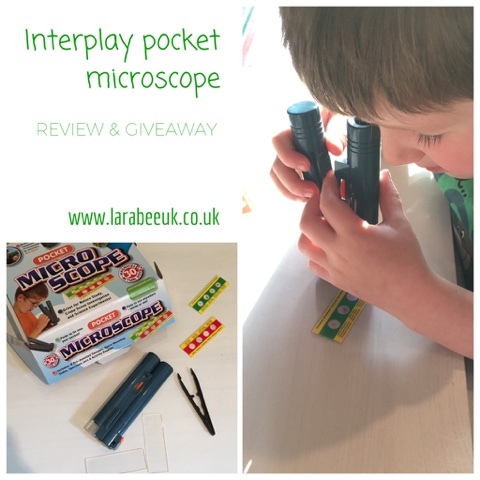 We recently recieved a pocket microscope from Interplay to review. 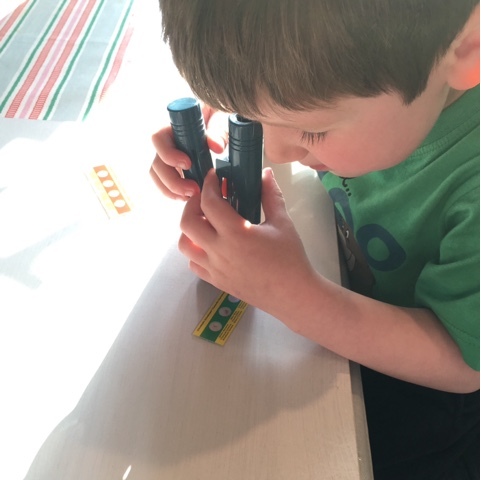 The microscope is designed for children aged 6 and above, but at age 4 with supervision, T managed to use it with great success and loved it! 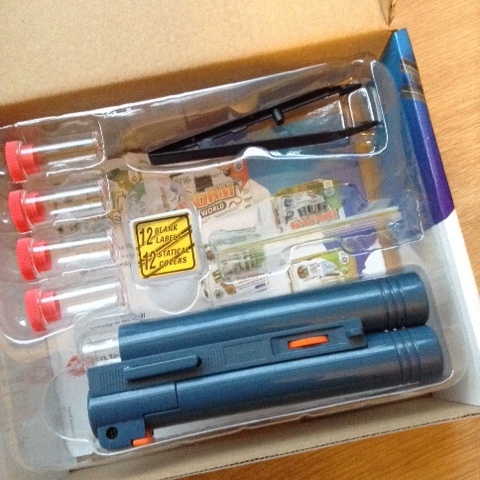 The pocket microscope comes with a selection of accessories, specimen bottles, slides and tweezers. T really enjoyed collecting his specimens from the garden and pond. The design of the microscope also means that you can look at bugs and larger items within the clear little chamber at the bottom without harming them. We looked at some bugs and flowers this way which was really successful. 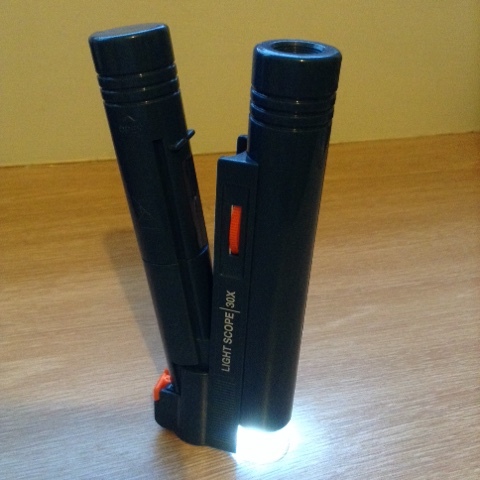 The microscope needs 2 AA batteries to make it work and it has a really clever design in that when you open the scope the light automatically turns on and switches off when you close it. I thought T would struggle more with looking through the scope, but he didn't, I did have to set the focus for him but once that was done he was fine to look himself, and really enjoyed looking at the slides that were including with the kit. 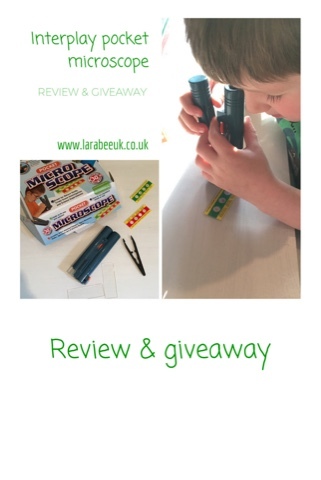 The pocket microscope has an RRP of £9.99, in my opinion a really good price for such a great little tool, I'm sure that this will be something much used in coming years. 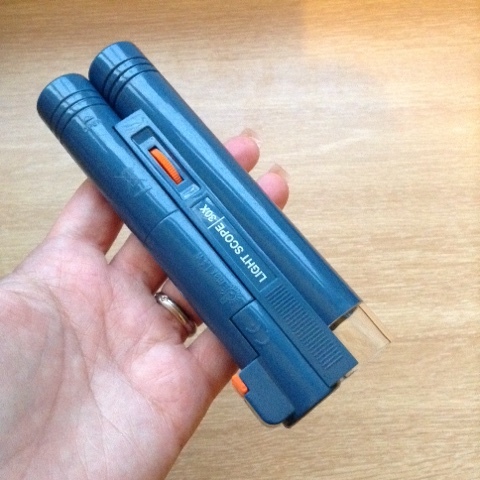 Disclaimer: we were sent this item in return for our honest review. I suspect it would be bugs. They're very into catching insects at the moment. Bodhi would love one of these he is always wanting to look at things in the garden closer !! Insects,they love looking at bugs. My son would spend ages looking a ants and woodlice- or any little insects he could find! My two are studying minibeasts at school and would no doubt spend ages examining those! My two would look at bugs! I suspect it would be bugs from the garden. I think my daughter would want to look at everything outside. As long as Georgia doesn't use it to look at spiders then I'm happy!! as much as i'd love to say bugs and insects like everyone else, my son would probably try and look at everything he gets his hands on! They'd look at flowers and sand probably to start with. I think my children would like to look at bugs and patterns. My granddaughter would definitely use it for looking at bugs of all kinds- has an inate fascination for them like most youngsters. my son would look at small stones and rocks trying to find fossils! Probably stuff he found in the garden! My nephew would look at bugs! I remember looking at onion membrane in school, I'm sure they would be as fascinated as I was.